Trois jeunes Rwandais fans de football font la route à pied pour assister « Africa United » raconte l’histoire extraordinaire de trois enfants rwandais qui tentent de réaliser le rêve de leur vie – assister à la cérémonie d’ouverture de la Coupe du Monde de Football 2010 à Johannesburg, en Afrique du Sud. Sur la route, les problèmes commencent quand Fabrice, Dudu et Béatrice montent dans le mauvais bus et partent pour le Congo. Sans papiers, sans argent, ils sont amenés dans un camp d’enfants réfugiés. Mais avec une incroyable ingéniosité, un peu de culot et une affiche de la Coupe du Monde comme carte, nos héros s’échappent du camp et repartent à la poursuite de leur rêve, en embarquant avec eux une « dream team » d’enfants réfugiés qui les aideront à traverser une série d’aventures désopilantes et palpitantes, à travers le Rwanda, Congo, Burundi, Tanzanie et Afrique du Sud. AFRICA UNITED tells the extraordinary story of three Rwandan children and their bid to take part in the opening ceremony of the 2010 Football World Cup in Johannesburg. Our pint-sized heroes set off in pursuit of their dream, picking up along the way a’dream team’ of displaced kids who help them negotiate a series of thrilling and hilarious adventures. During their 3000 mile journey, we encounter an Africa few people ever see; experience an epic adventure across seven countries; and feel the joy, laughter and hope that comes from making an incredible journey together, going through Rwanda, Congo, Burundi, Tanzania and South Africa. 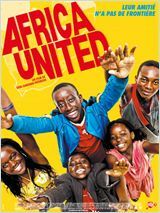 Africa United – a dramatic feature film to be released in cinemas sept-october 2010 – the fictional story of three Rwandan kids who end up walking to the South African 2010 World Cup – a funny, quirky, gorgeous, tragic road-movie love-letter to African kids and the beautiful game. Christmas 2008, Rwandan film-makers Eric Kabera (Rwanda Film Festival and Cinema Centre founder) and Ayuub Kasasa Mago (co-writer on’We Are All Rwandans’) contacted producers Mark Blaney and Jackie Sheppard of Footprint Films in the UK, and director Debs Gardner-Paterson with an idea. Those guys quickly shared it with Rhidian Brook, a screenwriter they were collaborating with on other projects (and who had previously spent a year with his family in Africa writing about the AIDS pandemic), and everyone had pretty much the same response – this is awesome and we need to get involved. This idea – a dramatic feature film about a bunch of Rwandan kids who make their way 3000 miles south to the 2010 World Cup football tournament in South Africa – is just magic to us. Although it’s fictional, it’s very believable, and as much comedy and adventure as drama and tragedy. We feel it’s an unbelievable opportunity to tell a totally different kind of African story with the backdrop of arguably the biggest world media event ever to be held on the sub-continent. This isn’t politics, war, tourism or safaris: the protagonists aren’t blood-thirsty thugs, pharmaceutical bandits or burnt-out aid-workers. This is an African kids’ guide to their continent, the issues that are facing them, and the challenges and huge amount of hope there is for their generation. It’s all very exciting, and possible and powerful. We can’t give too much away about the story right now – but suffice to say it takes the protagonists in and out of all different kinds of crazy and beautiful situations as they go, gathering and losing companions; living and learning as they walk – and although it’s set against the football tournament, will certainly be more a character narrative than a sports movie. Anyway – in early March, at the last possible minute we could get started and still have a hope to hit the timescale, we got development finance to get going (a great story in its own right) from our Executive Producer Stefan Allesch-Taylor. End of April, after a month of prep & research and a trip to LA for prelim meetings, Rhidian Brook (screenwriter), Debs Gardner-Paterson (director) and Bernie Gardner (composer) got on a plane to Rwanda, meeting up with Ayuub Kasasa Mago (Rwandan film-maker) in Kigali to get in a jeep and head south – going through Rwanda, Congo, Burundi and Tanzania to map out at least part of the kids’ journey – while Mark Blaney and Jackie Sheppard (UK producers for Footprint Films) and Eric Kabera (Rwandan producer for Link Media) stayed in Kigali for production strategy meetings, formal introductions and other crucial elements! We had also been joined by this time (sadly in spirit rather than in Africa) by Nathan Elliott and Will Hill, of the Doorpost Film Project. Their design/tech/social network/charitable focus/general good skills, make them an extremely sweet and highly valued addition to the core team. Equally brilliantly back in the UK, radio & TV personality Neil Fox also joined as an Exec Producer. Africa United vertelt het bijzondere verhaal van drie Rwandese kinderen en hun kans om een levensgrote droom uit te laten komen – deelnemen aan de openingsceremonie van het WK Voetbal in Johannesburg. Het jonge voetbaltalent Fabrice wordt ontdekt op een voetbalveldje in Rwanda. Nog maar één test staat hem in de weg naar de grootse opening van het WK. Maar onderweg naar die cruciale test slaat het noodlot toe, zonder papieren, geld of een geloofwaardig verhaal belanden ze in een opvangkamp in Congo, waar ze zo snel mogelijk uit willen ontsnappen. Met behulp van hun niet te onderschatten slimheid vinden de kleine helden hun weg naar het zuiden, op jacht naar hun droom achter de eindeloze Afrikaanse horizon. Onderweg vormen ze een ‘dream team’ met ontspoorde kinderen, die ze door een reeks geweldige, gevaarlijke en hilarische avonturen loodsen. Um garoto pobre e determinado, que adora futebol, acredita no talento de um amigo para o esporte e o convence a participar da Copa do Mundo, na África do Sul. Sem dinheiro e a milhares de quilômetros daquele país, eles partem, sem olhar pra trás, em busca desse objetivo. Ao longo do caminho, juntam-se a eles novos companheiros que passam a acreditar nesse mesmo sonho. Nada os fará desistir. Nessa longa caminhada, eles descobrem o verdadeiro significado de amizade, lealdade e perseverança.